On the left side in the picture above is a passive buzzer. The bottom looks less refined, with the PCB showing, no sealing. 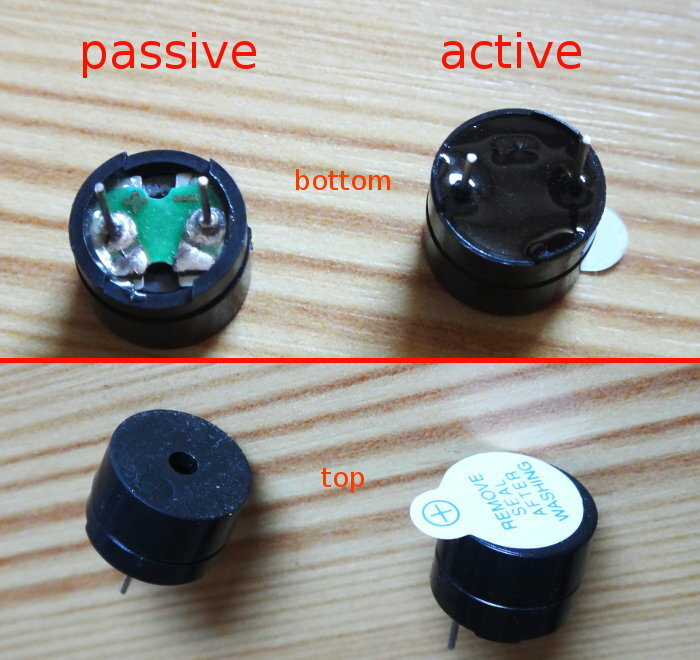 The passive buzzer is the simpler piece of both. You apply a voltage and that directly controls the little piezo element. Modulate the voltage and you get a sound. On the right side is the active buzzer. It has the modulation circuitry built-in. So you only have to apply a current and it will emit a buzz. In many cases, with these common Starter Kits, the active buzzer still carries this white sticker, stating "Remove Seal After Washing". Usually, you'd use the passive buzzer in Arduino / ESP8266 circuits, where the microcontroller produces a PWM current, that way controlling the frequency of the played sound. Related reading and experimentation: You might like to read my follow-up post Buzzer and OLED display on a NodeMCU microcontroller to see how you can buzz simple sounds with such a speaker.